This Midseason finale was epic. So epic that I was speechless and didn't know where to start. 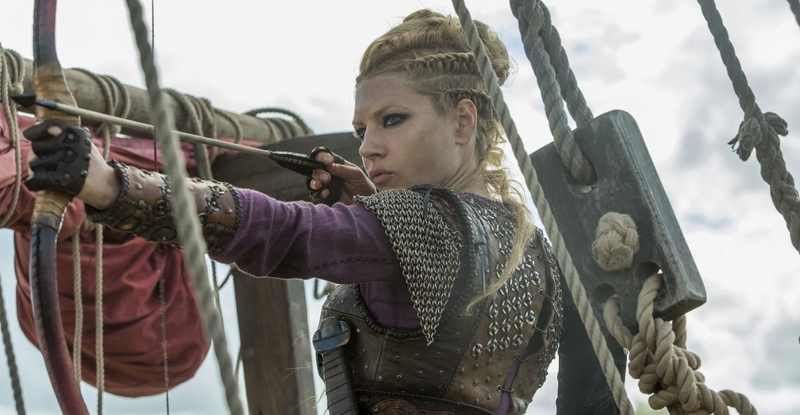 It took me a while to realise this is the last one before we have several moths to wait to see what happens to for instance Lagertha, King Finehair and his brother Halfdan. But let's start at the beginning of the episode. The episode is all about the brother feud between Ragnar and Rollo, but wait there is more in this episode we see a time jump and meet our new grown-up sons of Ragnar. We start with the battle between Ragnar and Rollo. Ragnar is there because he want to kill his brother for sure but is he able to do that? We have seen Ragnar very week and the drugs took his toll on him, but there is something else a burden that he has being King. Which one will take his toll the drugs or him being King? 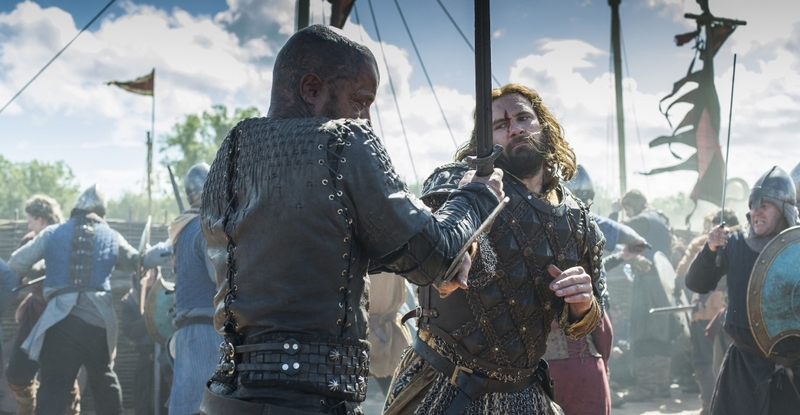 The battles begin between Ragnar and Rollo with a great jump to each other. During this fight who in itself is already amazing. We see a good battle strategy from both sites. Ragnar has the front rows which are full of archers. What goes around comes around because he has arrows with fire now. Rollo, however, has a Griffin head boat that can cross the platform from Ragnar's attachments to the boats. Between the fight there are things happening between Floki and the seer do they become one, do they feel the same pain or is Floki turn into Odin/Harbard, or is the Seer slightly dying in that scene? 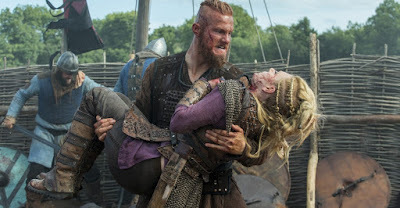 We see everyone hurt also Floki, Halfdan, Rollo, Ragnar but more important Lagertha while try to help Ragnar she still loves him. By this, it immediately stops the fight although Ragnar wants to attack Rollo again that same moment he pulled back in the boat to escape from the fight. Bjorn already brought the wounded Lagertha into the boat. Rollo let them get away. He stops the fight because the boat was still under attack he tells them to stop the fight. Bjorn needs to tell his brothers. The brothers are now grown up and played by other actors we will not see the younger actors anymore. 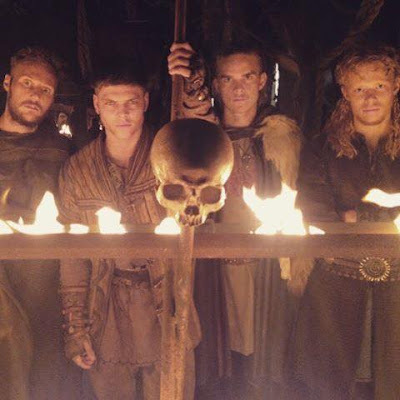 When Bjorn is at the cabin we meet the grown-up Ubbe, Hvitserk, and Sigurd at first after a few moments we meet Ivar. Then there is a conversation between the brothers there are a few who want to see Ragnar dead when he returns. He abandoned Kattegat but most of all his sons. The brothers are a bit jealous with Bjorn because he knows Ragnar the others not. I like that Ubbe wants to know his thinking and Ivar defends his father although he is the youngest of them all and hardly knew Ragnar. Bjorn thinks Ragnar broke quickly after leaving Paris and that he will never come back. Boy, he was wrong. In Paris, we see that the Emperor is smarter than Roland and Therese think they end up dead after they were completely honest. The Emperor believes in Rollo. When Rollo concurred his brother he crowned Caesar. It did me think one thing for sure he had become a hero in Paris but with double feelings. While sailing away from Paris we see a time jump when we arrive in Kattegat. The news that Magnus the son of Ragnar lives at the court of King Eckbert made Bjorn angry. The news about the settlement strikes more to him. He didn't know about that at all. When Ragnar returns to Kattegat we see a huge difference between the old and new Kattegat. There are more foreign sellers in Kattegat. we see it is bigger and it is definitely not the city Ragnar knew. While returning he finds out that he is no longer welcome. He finds his sons except for Bjorn. He wants to get killed so he is no longer king. He first starts with his sons who wants to kill him. It is the burden of defeat and responsibility that makes him like this. Is he blind on one eye? I am not sure. The episode stops when Ragnar is shouting: "Who wants to be King?"